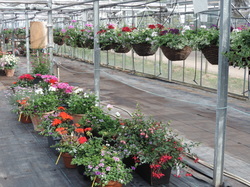 All pots and baskets are created with the plants grown on the Nursery. A number of different container styles will be on sale. 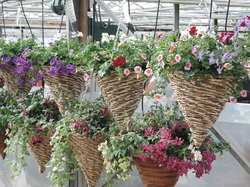 Hanging baskets range from 12" to 16" round baskets, wall baskets and the increasingly popular cone baskets. Items are designed for either a sunny or shady spot and contain slow release feed and water retention gel. If you have a particular requirement for your display, such as a large basket, container refills or multiple matching baskets or containers then an order may be placed. The Nursery has fulfilled orders for Public Houses, shops, weddings and a number of other public and private events. Please phone or come in to discuss any orders you would like to place. Items for the spring season will be available from the end of April through to the beginning of June.